Broadway has had a great season for musicals but only four shows were nominated for Best Musical. Now add two legendary megawatt stars in Patti Lupone and Christine Ebersole and you have all the ingredients for a huge hit, right? Well, it doesn't get any better than that- on paper, at least. The story has some sharply realized moments as well as some witty dialogue including several great zingers delivered perfectly by Patti Lupone. An example is when she recounts being rejected by a tenant board in a posh New York City apartment building because she was Jewish. When asked, "So what did you do?," she coolly replies, "I bought the building." But the story lags in spots, bringing the energy level down. And it is one thing to have two legends singing the songs- but most of the music is unexceptional. As is the choreography. And I was not the only one who had difficulty deciphering Patti Lupone's heavy German immigrant accent as Helena Rubinstein, particularly in Act One. I'm not sure if it was the audio engineer's fault on the night I saw it- and it did seem better in Act Two- but several people remarked they also missed some dialogue because her accent was just too hard to understand. David Korins' scenery and Catherine Zuber's costumes are first rate and they both earn their award nominations as the sets and costumes do a great job of enhancing the atmosphere and setting the scenes as the story goes from the 1930's to the 1960's. 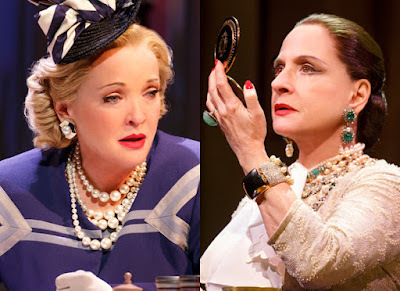 And both Patti Lupone and Christine Ebersole are Best Actress nominees. 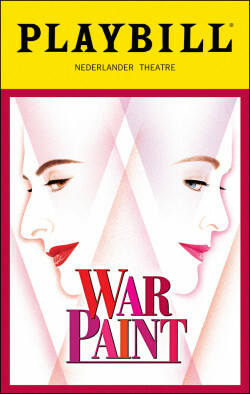 So, because the whole show doesn't fully connect, I give 'War Paint' 3 stars out of 5. Again, this has been a great season for musicals so there are many to choose from. 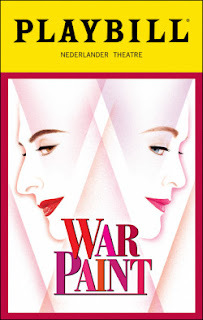 'War Paint' did receive 4 Tony Award nominations and it does have several entertaining scenes- plus the big added draw that it's a rare chance to see two Broadway legends performing on the same stage. All of the sheer talent involved in this production provide many reasons to see the show. And you know where you can get the best tickets: Applause Theater & Entertainment Service, 800.451.9930, or online at www.applause-tickets.com.